Via Clare Dillon the Virtual Earth blog and Martha Rotter on Twitter I spotted that Microsoft’s Live Maps now includes images of Cork, Galway, Carlow, Limerick, Navan & Wexford – cool! The Bird’s Eye button becomes active when you are over an area that Microsoft has detailed aerial imagery of. 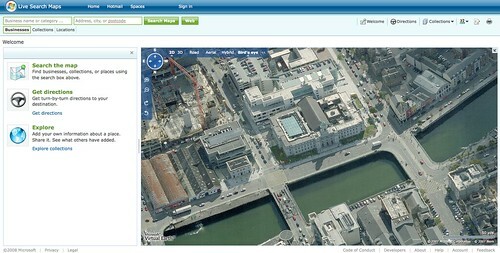 The image below is of Cork City Hall. You can rotate and zoom to see it from other angles and sizes! Way cool. According to Clare’s blog post, Dublin will be up soon as well.